An art car is a vehicle that has had its appearance modified as an act of personal artistic expression. Art cars are often driven and owned by their creators, who are sometimes referred to as "Cartists". Most car artists are ordinary people with no artistic training. Artists are largely self-taught and self funded, though some mainstream trained artists have also worked in the art car medium. Most others[who?] agree that creating and driving an art car daily is its own reward. Artists like Roy Lichtenstein, Andy Warhol and others have designed BMW Art Cars and their work has been reflected in racing cars like the BMW V12 LMR. "Animal print" art car Leopard Bernstein, with owner/creator Kelly Lyles dressed in matching motif. During the late 1960s, singer Janis Joplin had a psychedelically-painted Porsche 356 and John Lennon, a paisley Rolls Royce. Partly in imitation, the late 1960s/early 1970s counterculture featured many painted VW Buses (sometimes with a peace symbol in place of the giant VW logo) and customized vehicles (e.g. a customized 1977 Cadillac Fleetwood seen in the film Escape from New York). 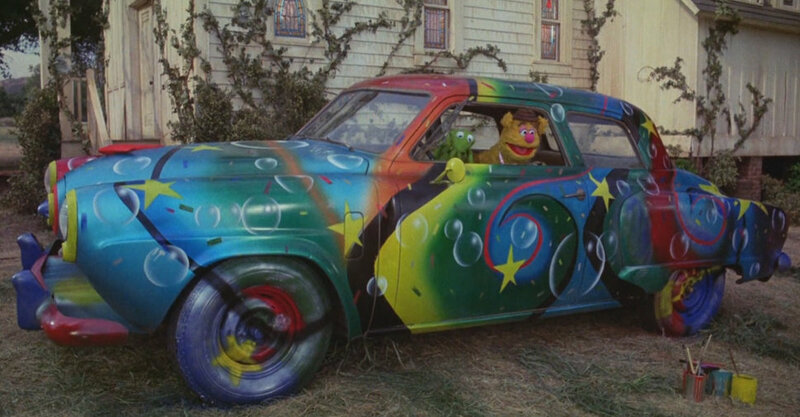 Likewise, as a way of evading The Muppet Movie's main antagonist "Doc Hopper", Dr. Teeth and The Electric Mayhem paint up the borrowed 1951 "bullet-nose" Studebaker Commander two-door owned by Fozzie Bear's uncle in a psychedelic manner, for Fozzie and Kermit the Frog to escape safely, at least for a while. Artist Larry Fuente was among the first to take motorized appliqué to the limit with his "Mad Cad." Later, artists Jackie Harris and David Best contributed their works to the art car world. An art car community began to cohere in the 1990s, inspired by movies and books with a wide underground following, and the development of innovative art display venues such as Burning Man. One of the main forces behind this is filmmaker and art car artist Harrod Blank, who created the art car documentaries Wild Wheels (1992), Driving The Dream (1998) and Automorphosis (2009). He also published two books Wild Wheels(1993, 2001) and Art Cars: the cars, the artists, the obsession, the craft (2002, 2007, 2012) Blank also co-founded with Philo Northrup the U.S.'s second largest art car festival in the San Francisco Bay Area: ArtCar Fest. Today many cars are covered by local newspapers and media. The only real way to get an idea of what is out there is to simply hit the road or attend an art car event. A New Year's Eve event in Houston, Texas, held on 31 December 2010 had over 100 Illuminated entrants, it is titled Gloworama, produced by ArtX (formerly Art Cars of Houston LLC prior to 2013 - their events are limited to illuminated vehicles only). The illuminated parade also drew the attention of the Galveston, Texas-based business empire Yaga's Entertainment, Inc. (the contract holder of Mardi Gras! Galveston 2011-2015) as part of their five-year contract signed on 18 November 2010. A well known early art car used for commercial advertisement was the Oscar Mayer Wienie Wagon—Later versions were known as the Wienermobile. These are bus-sized vehicles styled to appear as a hot dog on a bun. Commercial use of the art car has become popular in the 20th and continues into the 21st century. At the same time visionary applications including cars transformed into religious shrines continues to place visionary self-taught artists, student artists and corporate artists side by side on the road and at art car events. The art car culture was once strongest throughout Texas and the Southeast but now it extends throughout the United States and art car events can be found in many major cities as well as in small country towns. Art cars now very evident in the East, with a large event often held in Baltimore. In Canada, art cars are popular in British Columbia and also in the western Canadian plains with shows in Nanaimo, British Columbia and Regina, Saskatchewan. Other cars can be found throughout the world, most recently in Europe with the European arm of car-hire firm Avis supporting the movement. Later themes have become more widely focused and more satirical or dark. One of the funniest and most inventive entries in recent memory was titled "Student Driver:" it featured a telephone pole laminated through one corner of the cabin; a leg with roller skate still attached projecting from one wheel well; and sundry jokey dents and marks of mayhem all over the vehicle. Political or educational messages are incorporated when an artist realizes that they can take advantage of the attention they garner to advance a cause. Science fiction themes (monsters, giant insects from Them!, flying saucers) are common crowd pleasers. Expressions of the Gothic and the sublime are not unknown. Surrealism is commonplace. In parades and shows, shtick often includes "arted" bicycles or motor-scooters or costumed roller-skaters weaving among the art cars. Many art car owners are natural-born hams, and incorporate elements of music or street theater in their presentation. Art cars have been featured at Burning Man since its inception but in recent years the festival has been forced to limit the number of vehicles on the playa. As such they have restricted the vehicles that are licensed to what they are now calling "mutant vehicles". There has been some confusion within the Burning Man and Art Car communities over these two terms, with some believing the terms are simply synonyms. According to art car artist and Art Car Fest organizer Philo Northrup, art cars are "street-legal vehicles that have been permanently transformed into mobile sculptures". According to the Burning Man DMV ("Department of Mutant Vehicles"), Mutant Vehicles are "'art on wheels': radically, stunningly, (usually) permanently, and safely modified motorized vehicles". Obviously there is some overlap in these categories. In general, if you can still easily tell what kind of a vehicle it was created from, it's probably an art car. If it can't be legally driven in city streets, it's probably a mutant vehicle. While there is no clear line between where a car is called a custom car and an art car, in general art car has fewer stylistic guidelines and tends more towards folk art, whereas a custom car usually strives to stretch the rules of standard automotive design without breaking them. Lowriders and custom cars are often works of art in their own right and some art car parades and gatherings have allowed them as entrants over the years. Lowriders often sport elaborate paint jobs that clearly qualify as art, thus bridging the gap between the two cultures. ^ "'Art cars' find a lane on the main drag: Quirky creations gaining popularity." USA Today. 16 Sep. 2003. 7D. Web. Academic Search Premier. ^ Travolution (24 October 2011). "Avis turns to Facebook for ArtCar Competition". Retrieved 28 October 2011. ^ Marketing Week (24 October 2011). "Avis looks to social media to bolster European Footprint". Retrieved 28 October 2011. ^ "ArtCar Fest / Mission". Archived from the original on 7 July 2011. Retrieved 2011-07-12. Blank, Harrod (director) (1992). Wild Wheels (Film). USA. Klein, Tim. Art Cars Calendar, 21 January 2007. Retrieved 27 January 2007. Wikimedia Commons has media related to Art cars. BMW Art Cars An overview of all BMW art cars. This page was last edited on 29 March 2019, at 08:12 (UTC).